OVER the generations Sark has received her fair share of invaders. There was St Magloire and his 62 monks in AD 568 who founded a Monastery on the island. Eustace the Monk, in 1212 who tried to capture all the Channel Islands, but only managed to take Sark until Philippe d’Aubigny, warden of the islands defeated Eustace in 1214, thereby regaining control of the small island. Yet again in 1338, Admiral Behuchet of France captured all the islands except Jersey and again on 21st July, 1549, the French took control of Sark. Fortunately they were defeated when they attempted to take Guernsey and Sark was left deserted until the arrival of Helier de Carteret. From his home in St Ouen, Sark was clearly visible to Helier de Carteret and knowing the island was unpopulated, he set sail and landed there in September, 1563. He received a charter from Queen Elizabeth granting him the rights to the island on condition that he maintained 40 men on the island to hold it safe for the Queen. He therefore became the first Seigneur of Sark. One crucial section of the charter granted the Seigneur all the mining rights which later brought another invasion of Sark; this time by Cornish miners. From as early as 1609 there had been rumours of mineral deposits on Sark although nothing was ever done until 1833 when John Hunt arrived from Chiselborough in England. He was a mining engineer and, on investigating the area around Creux a Pot, he found a vein of copper and silver. The de Carterets had been Seigneurs from 1565 until 1720 when they sold their rights and so it was that Peter Le Pelley, now the Seigneur, found himself holding all the mining rights on the island. John Hunt received a concession from Le Pelley to open mine shafts and the contract was signed on the 17th October, 1834. Hunt had to pay £1 annual rental as well as give Le Pelley 6% of all the ore brought to the surface, the lease was to run for 31 years, but was later amended to 39 years. Work commenced at the end of 1834 with 250 Cornish miners being brought over to open the shafts. Their efforts were confined to Little Sark around the eastern coast known as Le Pot. Over 70 locals were also employed and for a few years more people dwelt on Little Sark than lived on the whole island at any time during its history! However no great quantity of ore was discovered and a further dramatic setback occurred on 1st March 1839 when Peter Le Pelley was drowned in a boating accident off Pointe du Nez. His brother Ernest became Seigneur and showed great interest in mining. He mortgaged his Seigneur’s Rights for £4,000 to help the cost of more mining equipment. Meanwhile a man out shooting climbed down the cliffs at Port Gorey to retrieve a rabbit when he discovered some rocks containing a strong silver content. This was to be the start of the most productive of the four mines known as Sark’s Hope This shaft went to a depth of 360 feet with one gallery extending 300 feet out under the sea bed. The Le Pelley shaft had a depth of 600 feet. Prince shaft 366 feet and Engine shaft 480 feet. John Hunt also tried mining in Guernsey, Herm and Brecqhou and had formed the Guernsey and Sark Mining Company, whose offices were at 25 Commercial Arcade in St Peter Port. Two hundred shares of £5 each were issued with Hunt holding 30 and Le Pelley 10. With more money constantly needed, Hunt placed a silver tea and coffee set made of Sark silver in the office window to attract investors. A landing place had been blasted at Port Gorey and a narrow gauge railway was used to bring equipment to the mines and carry the ore to the waiting boats. Good quality ore could fetch up to £600 per ton but all the shafts were drying up and the company was getting further into debt. The final nail in the coffin was the flooding by sea water of Sark’s Hope? This had been the most productive shaft and no further capital remained to purchase pumps to empty the flooded galleries. the total cost of the mining operation had been £34,000 with the yield only 25,000 ounces of silver plus several tons of lead which fetched £4,000. The machinery was sold late in 1844 and all work ceased in 1845. Le Pelley tried to raise the money to pay back the mortgage on his Seigneur’s Rights but finally sold out to Marie Collings in 1852. This ended all mining in Sark. The Cornishmen went off to new mines being opened in America. John Hunt was left a broken man and Le Pelley had lost the Rights for his family to continue as Seigneur of Sark. 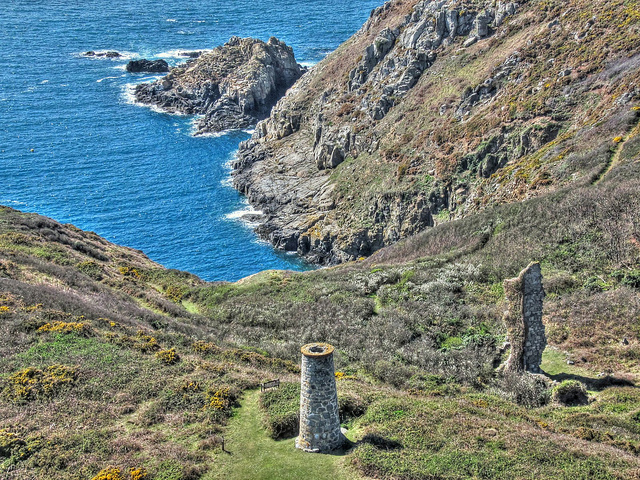 As with past generations, the invaders retreated and left Sark in peace with only a few broken-down buildings, a couple of chimneys and some dangerous shafts as a reminder of the Guernsey and Sark Mining Company.